Opulent tassels and a shimmering border inspire wanderlust in this lightweight Metallic Wool Wrap that adds a dash of the exotic to any look. $118. Free shipping. Buy here. 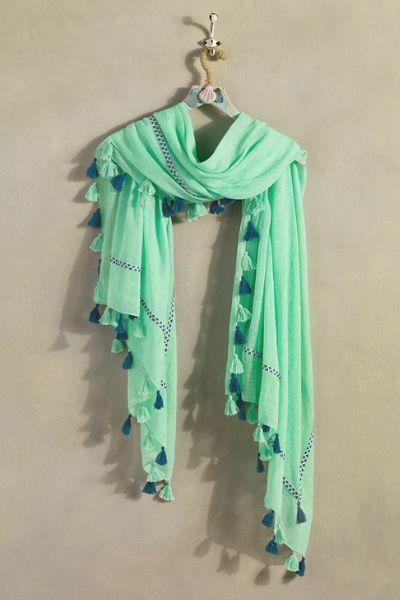 ThisÂ Infinite Wishes Scarf features airy stitched and knitted strands with delicately draping fringe that makes the perfect accent. $38. Buy here. 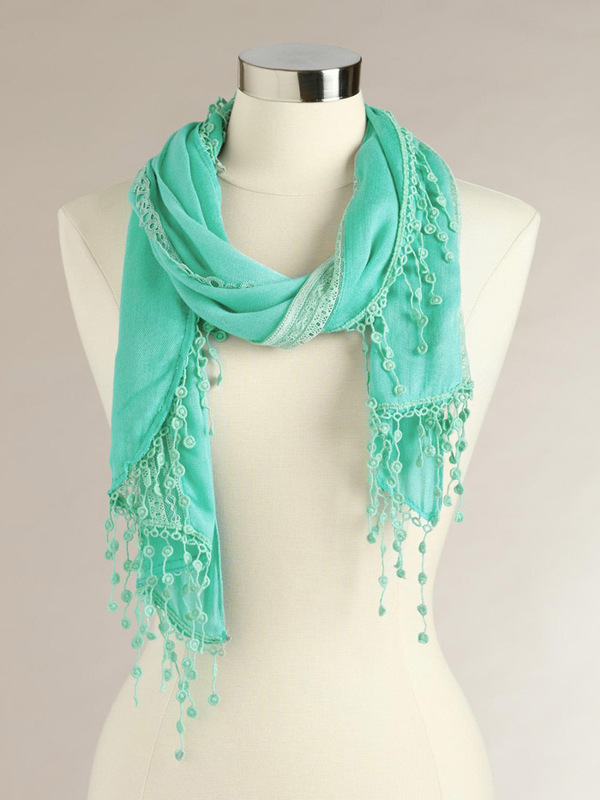 Stay cute and cozy with this Turquoise Shiraleah Luz Scarf. 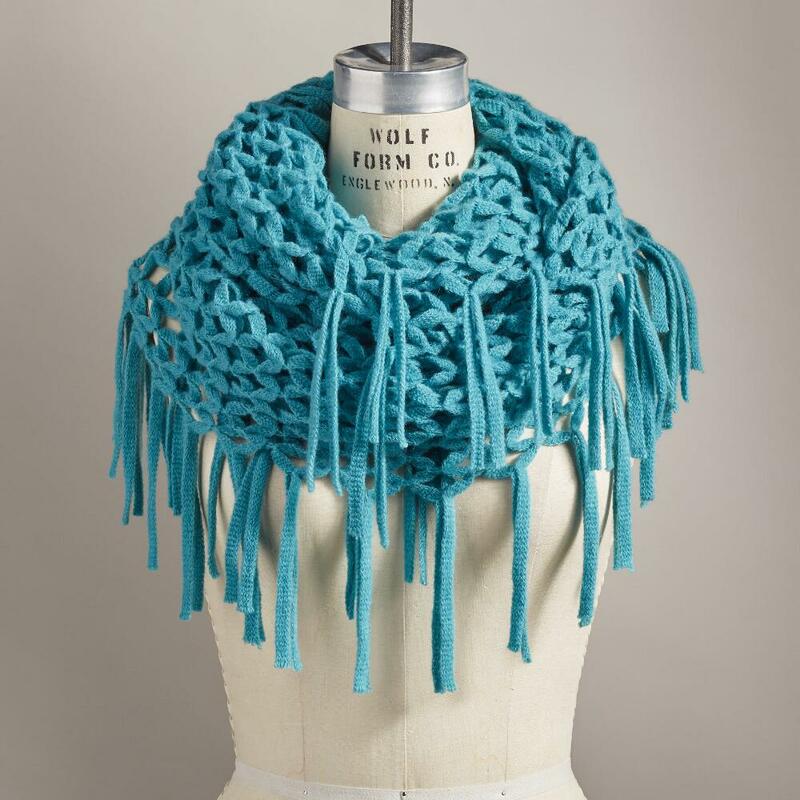 Features knit construction and fringe trim. $35 Sale $16.97. Buy here. 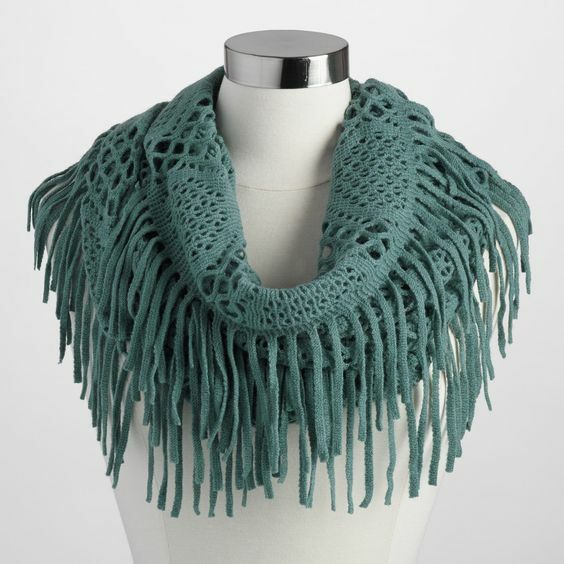 This super-soft Green Fringe Infinity Scarf has long fringe detail and wears well with any look, day or night. $19.99. Buy here. 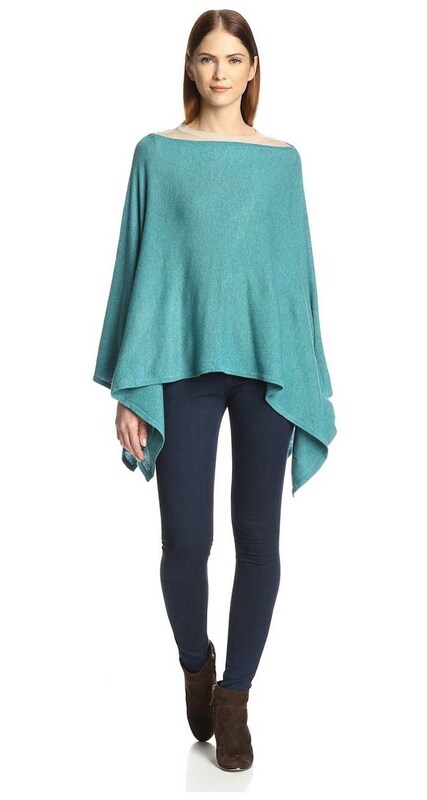 This cozy and stylish Teal Scarf Poncho from NORTH ELEVEN makes a great layering piece. 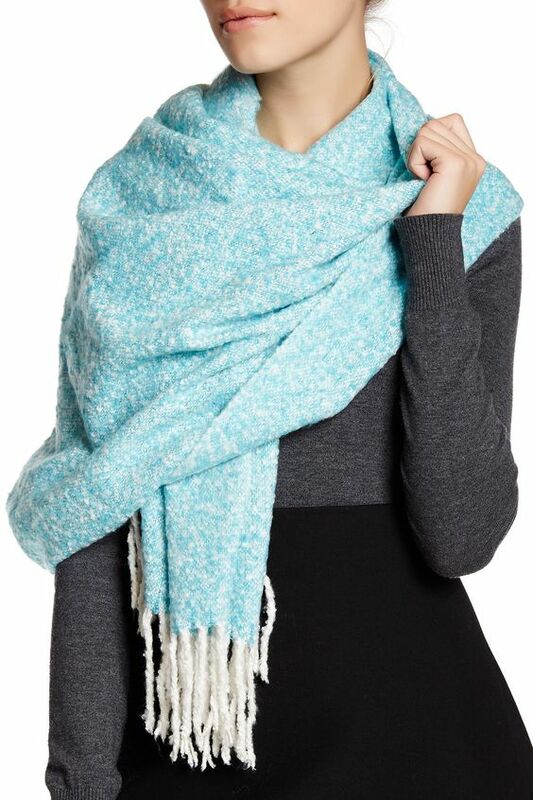 Made from 85% Wool/15% Cashmere. $69. Buy here. 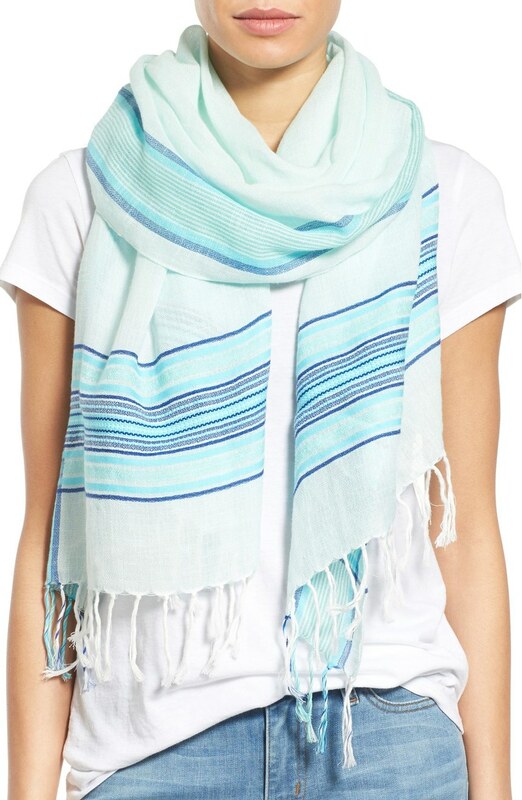 Pickstitched stripes add Southwestern style to a breezy, fringe-trimmedÂ Teal Pickstitch Border Scarf cut from a lightweight blend of cotton and linen. Â $38 Sale $22.80. Free shipping. Buy here. 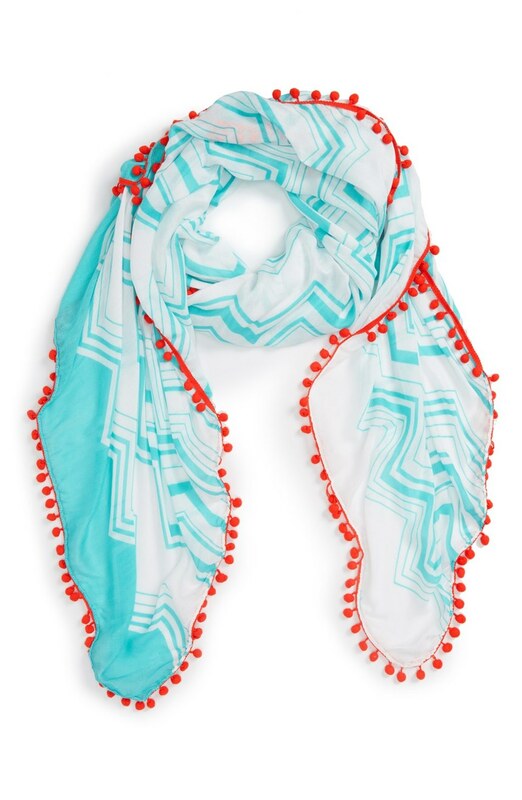 Mixed-scale zigzag stripes pattern this brightly huedÂ Turquoise Julia Pompom Trim Scarf with color-pop pompom trim. $34. Free shipping. Buy here. 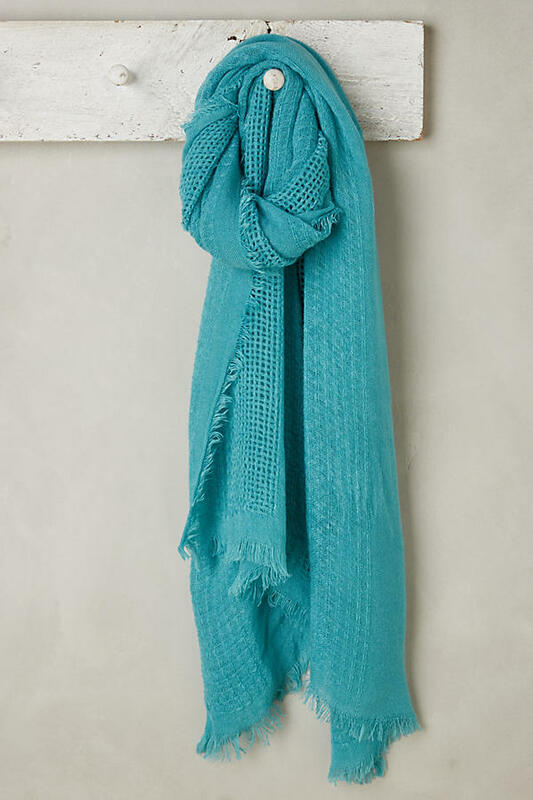 All your favorite shades of blue come together in this fabulous, lightweight wool Blue Crush Scarf, highlighted with glistening woven-in lurex threads. You’ll love the subtly luminous sparkle. $59.95. Buy here. 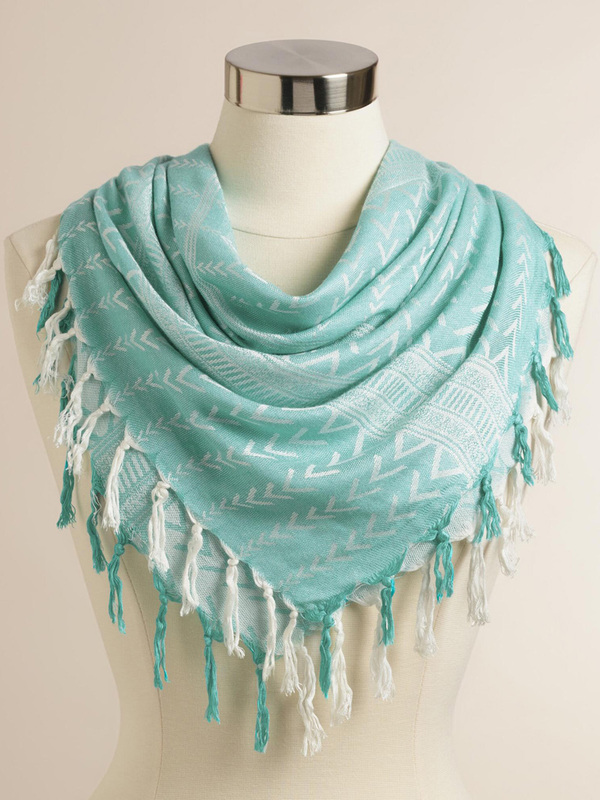 Navy geometric trim borders this dreamy-soft cotton Lani Scarf, an impressively sized rectangle in a pretty shade of turquoise, accented with fun navy and turquoise tassels to bring summery color to your season. $34.95. Buy here. 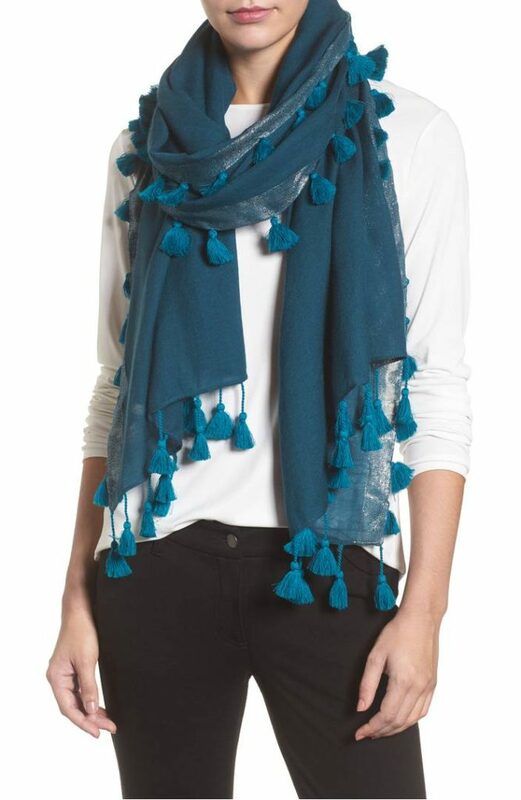 Made of feminine crocheted lace and trimmed in fringe, this vibrantÂ Turquoise Lace Crochet Scarf with Fringe adds a modern twist on warm style. $22.99 Sale $17.24. Buy here. 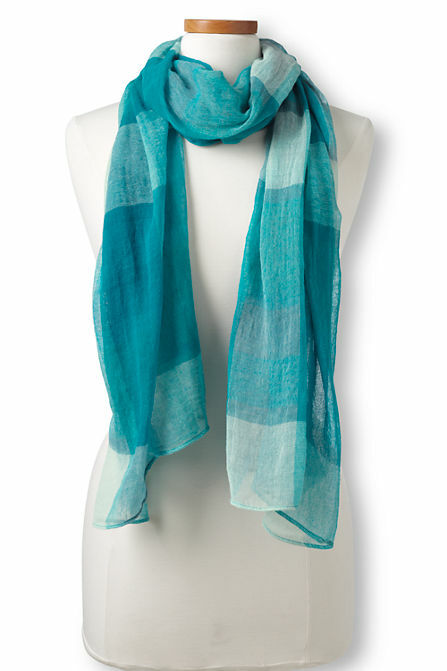 This Aqua Pistil Kea Scarf is soft with a lightweight, airy feel. 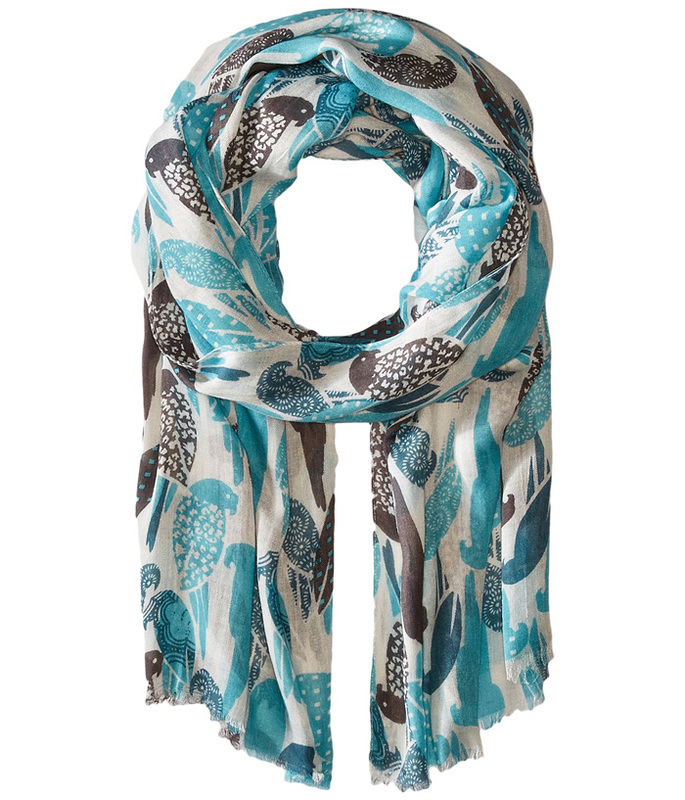 Features a bird print throughout and unfinished edges for a casual look. $34. Free shipping. Buy here. 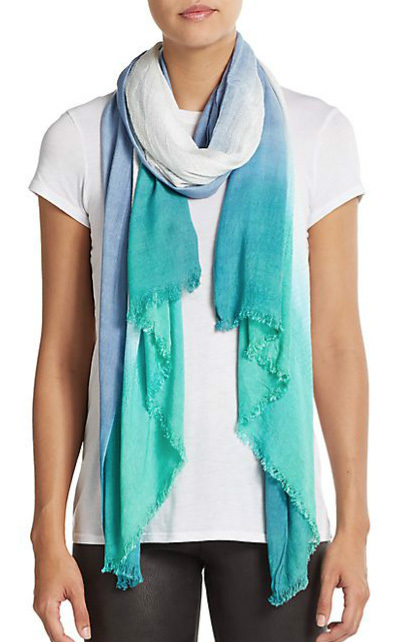 Dip-dyed edges add a pop of color to this chic Bright Aqua Dip Dye Rectangular Scarf featuring fringed edges. $38 Sale $19.99. Buy here. An airy, lofty dream for sunny days and evening strolls. 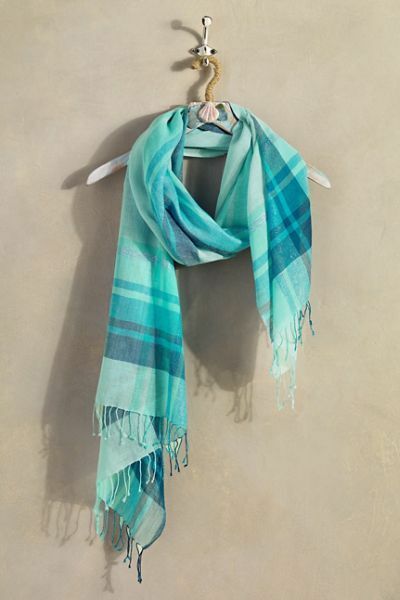 This perfect warm-weatherÂ Turquoise Plaid Scarf adds a lovely color pop to enhance your outfits while its oblong shape allows for endless tying options. $29. Buy here. Delicate and elegant, with just enough scene-stealing material to shake up your look. 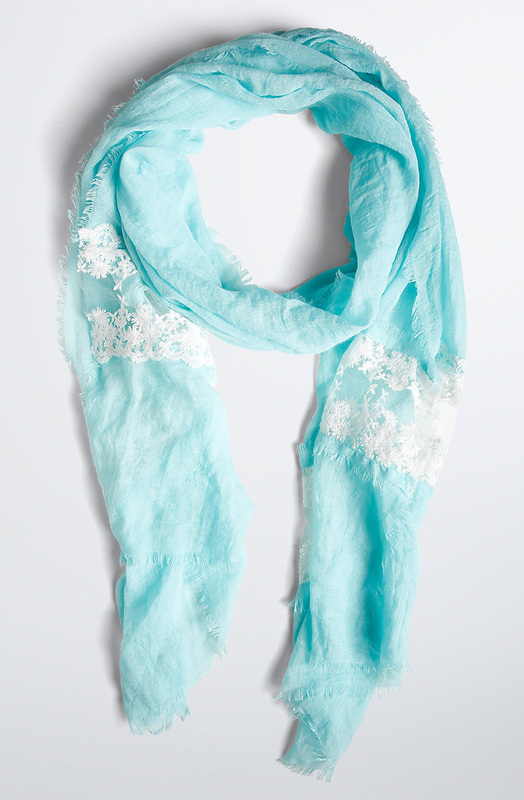 This lightweight linenÂ Turquoise Lace Infinity Scarf is eye-popping, while the delicate white lace insets are way romantic. $19.50. Buy here. 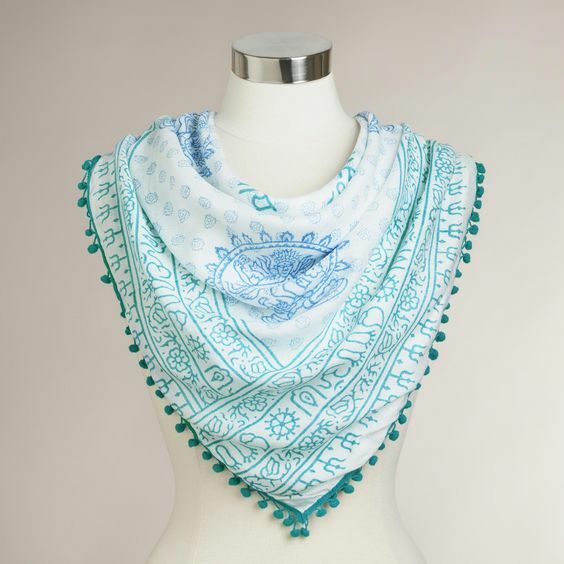 Accessorize beautifully in this eclecticÂ Square Turquoise Woven Scarf featuring a paisley print against a turquoise background and tassels at each end. $24.99. Buy here.